Porcelain veneers are extremely thin casings of ceramic that are bonded to the front of the patient's tooth to create a new smile. Porcelain veneers are placed over the front of teeth that appear too small or large, slightly discolored, or simply are not cosmetically pleasing to the patient. For many patients, teeth may have chipped, become discolored, or are slightly crooked. 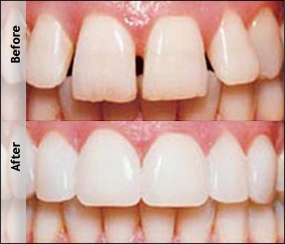 For the majority of these patients, porcelain veneers can prove to be the perfect solution.